Yang, described as a "paper farmer" on his household registration certificate, said: "When I was a child, I never thought papermaking was special. Almost every family in the village worked in the industry. They owned workshops or worked for other villagers." Now, he is dedicated to maintaining his family's traditions. Most of the younger villagers have migrated to work in cities, so Yang employs 12 seniors. He displayed photos he had taken of them turning green bamboo and grass into yellowish paper as if by magic. "They are just like my family," he said. According to Tang, the traditional craft is still held in high regard. "Paper holds many of our nation's cultural memories. It used to be inseparable from people's daily lives. For example, it was used to make lanterns, umbrellas, windows－when glass was not popular－and even clothing," he said. "Unlike in the West, traditional Chinese arts, such as painting and calligraphy, were done on paper. Paper shaped our artistic tastes." 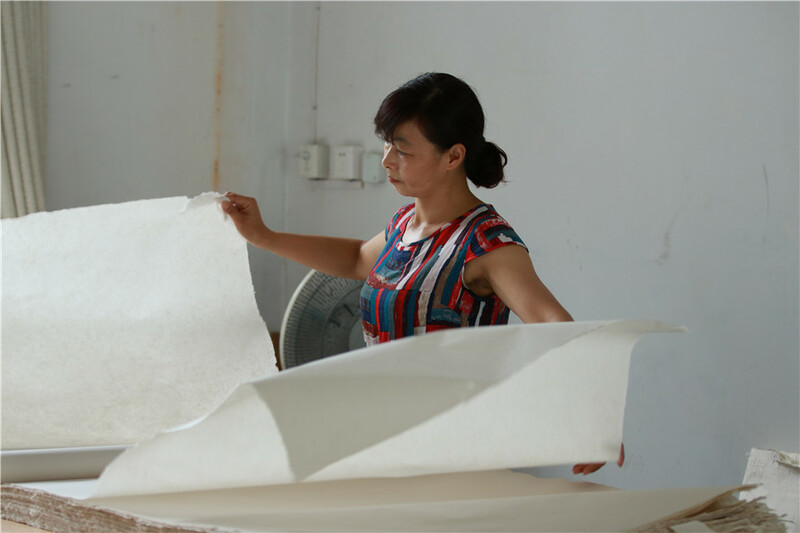 Jiajiang is one of the few surviving types of paper regarded as a perfect medium for calligraphy and painting, which dominate the use of handmade paper. However, different types of paper are required for different creations, according to Tang, who has been cooperating with papermakers to recover several vanished brands. "Once a technique dies out, it can be very hard to revive," he said. "It will be like a gene bank for different types of handmade paper," he said, adding that the final published work－focusing on production processes, the history of papermakers, their current status and laboratory data about their products－will comprise 18 million Chinese characters. The first half is almost complete.